To board members and business divisions, cloud-based services present an ideal solution for the delivery of adaptable technology services, which include services, applications, software licenses and infrastructure. Analogous to how electricity is delivered today, cloud-based services allow businesses to provide technology services as a utility, where supply mirrors business demands and changing volumes. There are many business benefits that make cloud-based services attractive to executive leaders. First, the business’ capital expenditure decrease because the delivery of cloud-based services are charged as an operating cost. Additionally, development becomes agile and production lead times are reduced as business is componentized into a core set of services, which can be delivered as demand requires. This improves the time to market for new products and allows faster reactivity to changing business dynamics. Finally, engineering the company and business processes around a standardized set of cloud-based business solutions provides better predictability as each service can be utilized as needed to meet varying business demands. To a new business, using cloud-based services is often clearly the ideal choice. For established businesses, the choice can be more difficult, as transforming legacy operations and technology into a cloud-based services model presents a host of challenges. Transformation, which requires moving operations and technology, which is a sunk capital cost, to cloud-based, componentized services can be a complex, time consuming and expensive endeavor. To mitigate transformation risks, companies use the predictive capabilities of X-Act platform to first prove the business case, then determine the best migration strategy and finally manage the execution of the change program. In today’s interconnected world, providing the promised service level to customers is key. Project failures have a direct impact on brand reputation and pose a continued operational risk to new and established businesses alike. In order to fully exploit cloud-based services, businesses must take a top-down, business led approach that considers the entire operational model as well as the underlying technology services. X-Act supports a Computer-Aided Engineering (CAE) approach to cloud migration that allows users to predict how business and technology service components can be optimally used by the business for development and operations/production. To quickly build representative models, X-Act libraries provide pre-built and fully configurable elements that cover a wide range of business and technology service components. Examples of X-Act library’s 10,000 certified components include pre-built models of a payment service, customer database, reservation booking, settlement service and call handling service. X-Act’s built-in and configurable libraries of service components and predictive capabilities are used to develop and transform the business operating environment. Through this process, business volumes and costs, based on the utilization of underlying technologies, are optimized and adjusted in line with demand. In all cases, X-Act ensures the customer’s service levels and experience is maintained and improved in alignment with the requirements of the business. X-Act platform supports the level of due diligence and groundwork necessary to ensure a smooth transition to the cloud. By delivering clear and actionable intelligence, X-Act helps answers the business’ questions so that stakeholders can identify and agree upon the best-fit solution before committing any time or resources to a cloud migration program. During the execution phase, X-Act provides the foresights necessary to ensure an optimal outcome that weighs both short and long-term cost benefits in alignment with performance and scalability goals so that the business can minimize risks and consistently gain all the benefits the cloud has to offers. 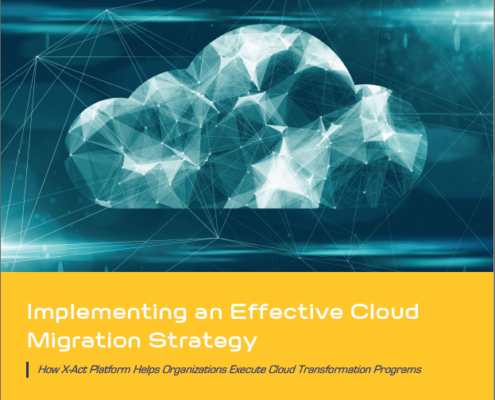 The Implementing an Effective Cloud Migration Strategy white paper explains how businesses use X-Act platform to build an integrated strategy with clear intelligence of the optimal service commitments for quality, quantity and continuity balanced against cost for each critical business and IT workload.